When energy radiations strike the surface of the world, they get demonstrated back into the ambiance. They get assimilated by green house toxic gases that consequently re-radiate them in varied guidelines, mainly because they tour away from the earths area. Rays to your surface of the planet earth endlessly elevates world-wide conditions. This indicates that an increase in the total amount of garden greenhouse toxic gases ends up in substantial atmospheric temperature ranges. These sort of gas involve fractional co2, carbon monoxide, methane, nitrous oxide,hexafluoroethane and tetrafluoromethane, and sulfur hexafluoride. Normal worldwide temperatures are already within a uniform surge about ages, because confines of these kinds of unwanted gas have always heightened contained in the surroundings. It is usually this process that is labelled as climatic change. Current promises have arisen from some analysts which the overall concept of global warming is groundless, all the same. To substantiate their clams, they provide an array of information and facts connected with atmospheric stages of greenhouse gases, beach acidification, the melting of polar an ice pack, and historic climatic patterns. Irrespective of these assertions, climate change will continue to appear as confirmed by expanding sums of green house fumes, acquiring volumes of heating, fall in Arctic and Antarctic ice, and tragic incidents all over the world. ‘Held in Exmoor National Park, one of the most picturesque areas of England, Wimbleball Lake has been host to IRONMAN 70.3 UK since 2006. With many athletes choosing to camp on site, it has a unique atmosphere. The reputation of the event has been set by its rural location and the challenges of the bike course’. ‘The swim course is one lap, clockwise, starting 20m from the shore. The IRONMAN 70.3 UK Exmoor bike course is a tough two lap course right in the heart of Exmoor National Park. The course leaves Wimbleball lake and follows an anti clockwise loop through hilly terrain in a picturesque part of Somerset. The run at Wimbleball Lake is a three loop course on a mix of terrain including tarmac, hard pack trail and grass. The course remains firm underfoot even during prolonged bad weather. There is one short sharp climb in the course which is tackled three times’. 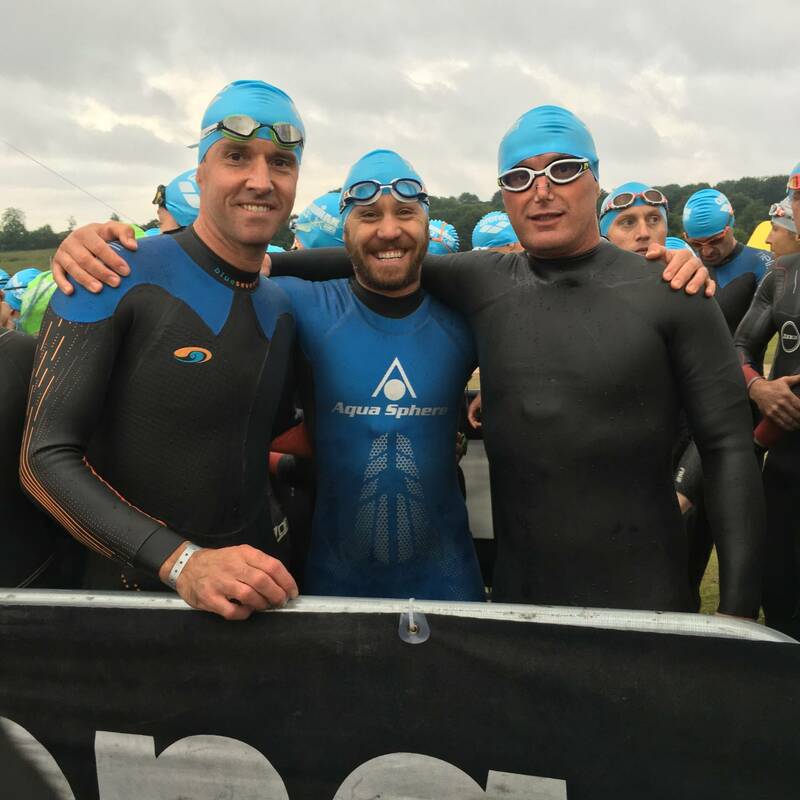 Blackburn Harriers Brian Fogarty, Paul Guinan and Paul Slone along with Ian Cox were competing in the Ironman 70.3 for the Fitt Team held in Exmoor National Park at the weekend an event which finished up with an amazing one thousand and eighteen finishers. Brian Fogarty is in excellent form and is building up for the UK Championships being held in Bolton which is three weeks away. 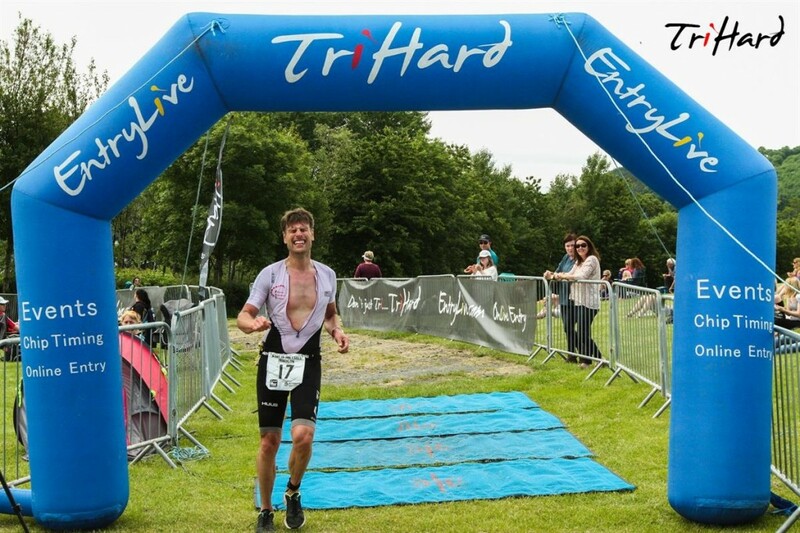 That form held up in Exmoor as he just missed getting onto the Podium by six seconds after competing in the Swim, Bike Ride and Run for a total time of 4hrs 35.16 – the third placed athlete finishing in 4hrs 35.10. Brian spoke to the Club after the Race had finished telling us that the “Uk 70.3 Ironman Wimbleball is regarded the hardest in the world, i can certainly see why. I went into this race high on confidence and really looking for a big performance. A had a good decent swim which helped me get into contention on the bike early. 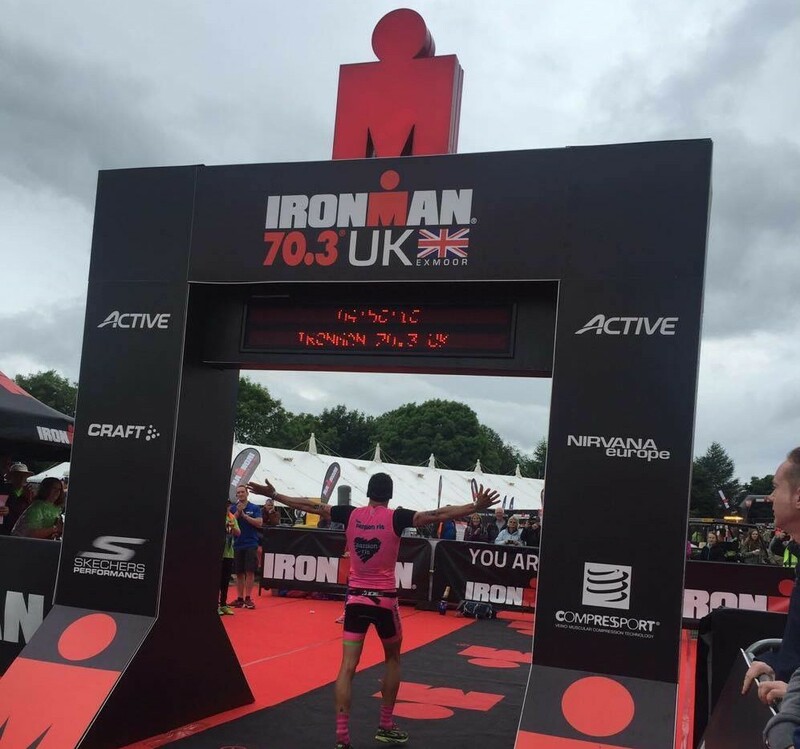 By 20 miles i lived a dream… i was actually leading an Ironman race!! i decided to roll the dice and push things for the second half of the bike. This worked well and i went into the run with a 2 minute lead. 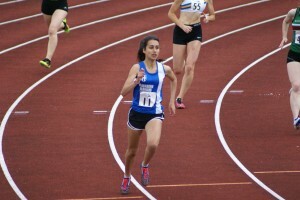 I ran to form and was holding good pace on a very challenging course. Unfortunately i was being chased down by 3 very fast runners and got past by 2 after 4 miles. My pace didnt drop and i felt 3rd place was secure until very late on when i got passed by another and got beat to 3rd by 5 seconds. 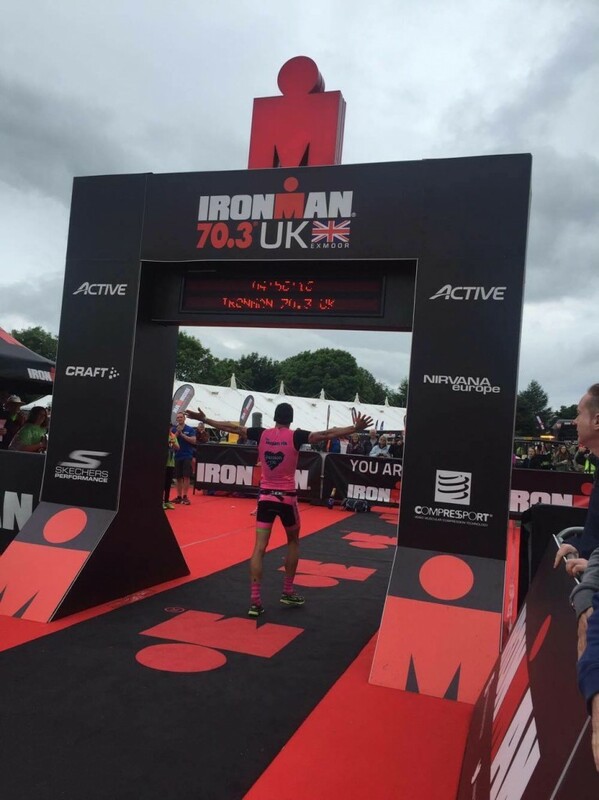 This was very disappointing but i can take lots of positives from this race going into the big Goal of Ironman Uk in 3 weeks time”. Paul Guinan was the next athlete home behind Brian in a very good 63rd place with an overall time of 5hrs 17.22. Apart from a couple of Half-Marathons recently, Paul hasn’t been able to compete that much after having to overcome a number of injuries over a pretty long period of time. After the event Paul told the Club that he was “Really pleased overall, but like any athlete always want a bit more, exited the water in 6th place after a solid swim, which did actually put a smile on my face and a bigger one on my daughters !! Unfortunately l could not hold that place on the Bike but held a decent place going into the run, solid enough throughout and finished strong, great to be part of FITT who all performed really well. Ian Cox had a great race and so did Paul Slone who is new to the sport, both very well done, but my admiration goes to my training partner and fellow Blackburn Harrier, Brian Fogarty, l have been with Brian right from the beginning, witnessed his first win some years ago and now leading an International race for a considerable time, quite amazing really, the talent and raw power he produces is quite incredible, taking lumps of time out of very high calibre athletes on the Bike is a special talent to have, and he has it, he was caught on the run but with some more work and good coaching over the winter hopefully he can hold that top place and win a major race, not only for FITT but also Blackburn Harriers”. Just over two minutes behind Paul, with another good performance, came Ian Cox in 76th place with his overall time being 5hrs 19 .55. Paul Slone is an athlete with an inspirational story and an example of what can be achieved with mental toughness and a positive outlook. Paul came home in 424th place out of a field of 1018 finishers in the event with an overall time of 6hrs 16.12. What few people know about, is the battle that he has gone through, just to get to the point where he could race. When he responded to the Club for a comment about his Race experience he told us that it was “Such a tough course. Bike and run. Absolutely no let up on the bike course. 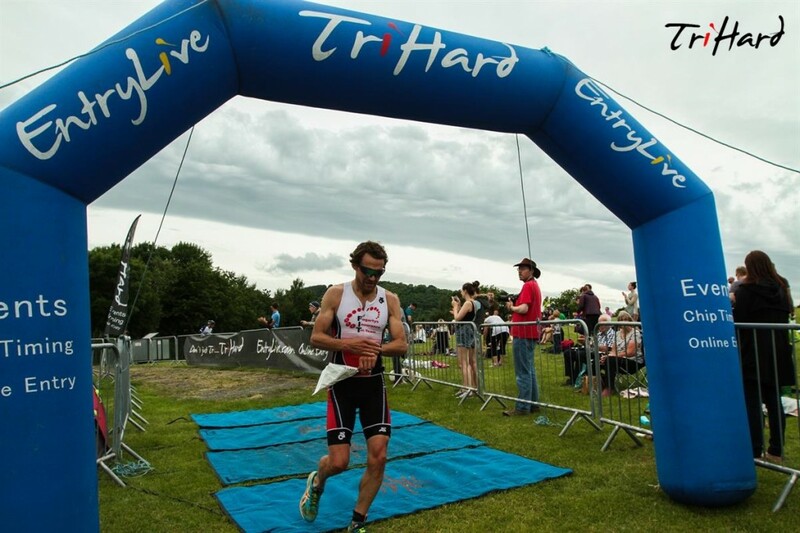 Wimbleball is supposed to be the toughest 70.3 in Europe and for me proved that it is. For a beginner at 49 yrs old it was a real eye opener. Learnt a lot from this completing this race. Took advice and treated it as a hard training excercise rather than a race and I’m glad I did! Not for the faint hearted. Great warm up for the full IMUK in Bolton in a few weeks”. It was only later than the Club found out exactly what he had endured in terms of his health, which for a lot of people would have been enough for them to call it quits. This is how Paul described his unbelievable journey in getting to compete in the Ironman “Twelve months ago I could only stand for short times. I have psoriatic arthritis and it manifested in chronic plantar fasciitis, double tennis elbow, double golfers elbow bad knuckles etc. Basically it’s psoriasis in each tendon where it attaches to the bone. Hadn’t ran for four years since my maiden marathon. Getting treatment now but got told off the docs to take up scuba diving! Zero impact. I told them I wanted to train for a marathon again. Doctors laughed as they do. So ironman it is! So tough in the body. I’ve also ruptured a bicep tendon two weeks ago swimming is a nightmare. My right arm swells like a rugby ball. Tendons in knee are agonising on the bike and in bits on the run. As they say in ironman. Anything is possible! Hopefully after this, the Bob Graham round penciled in for next April on my 50th!! Don’t think I’ll ever be on a podium but when you realise things are out of your grasp and you get a hint of a chance it becomes precious”. 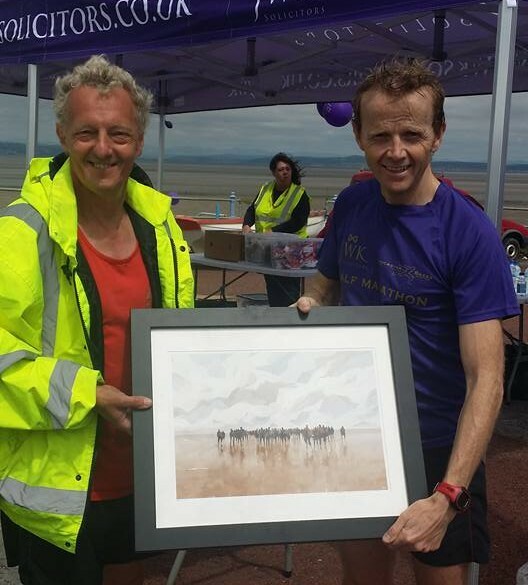 Shaun Livesey (V40) and Paul Clarke (V55) were out at this relatively local Half-Marathon held in Morecambe at the weekend. It turned out to be a pretty good decision by Shaun as he went on to win the Race comfortably by two and a half minutes and commented that he “decided to race on Sunday up at Morecambe over the half marathon distance. Had a look at the course on strava and there were a few quirks, there was a stretch on the beach that lasted for 300m and there was also a footbridge going over the railway line. Apart from that it looked like a flat fast course. I signed up on the day and at the start I looked around for any familiar faces (contenders) I didn’t see any and thought to myself it might be my day. The gun went and I went straight to the front. I had company for the first mile then that was it, I was by myself for the rest of the race. My focus was to try a keep a good pace but not have to work too hard, this proved difficult as the route turned back and into a slight headwind, but it was enough to slow my pace. There was also a section along the prom which was still under construction and I had to duck and dive around dogs and people in motorised scooters. I crossed the line in 1:18:06 5:59 pace reasonably pleased with my effort and my second race win of the year. I won a picture some bathroom scales and a nice bottle of wine for the wife”. Paul came home in 34th position overall with a time of 1.49.08. 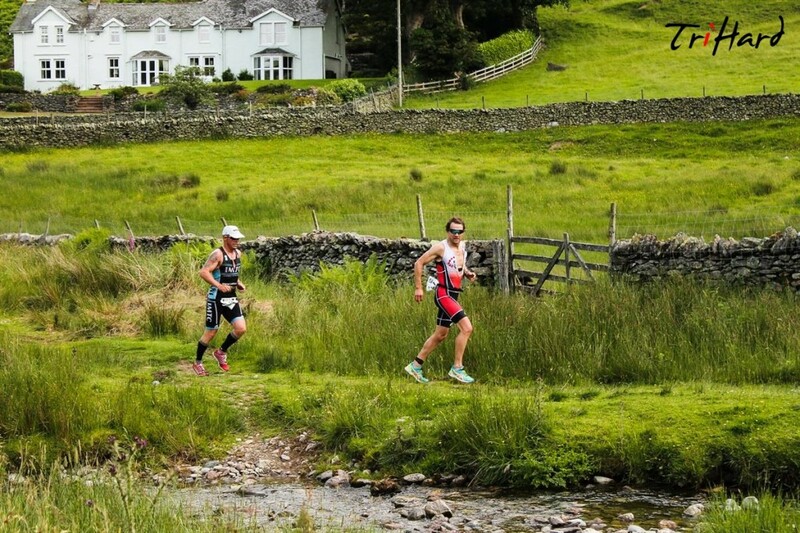 Nearly two hundred athletes finished this tough Triathlon held in the Lakes last weekend and among them two Blackburn Harriers – V40’s Mark Bleasdale and Matt Nuttall – who were competing for the FITT Team. 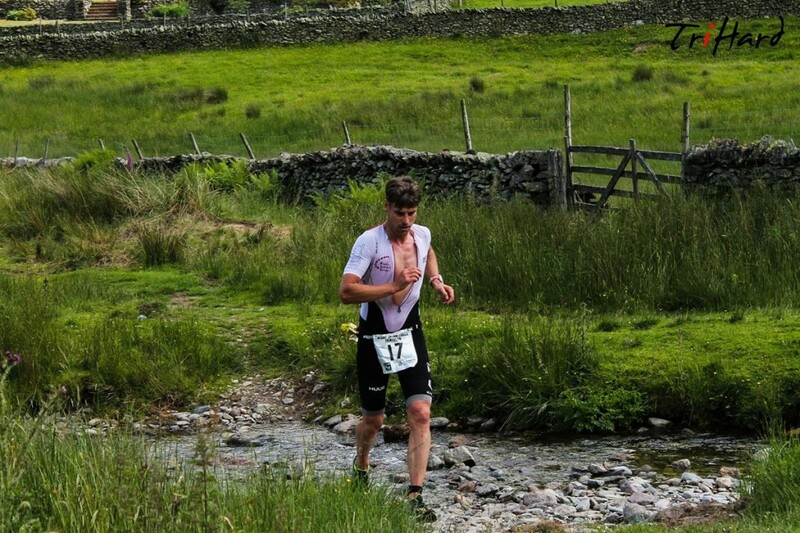 It was a brilliant performance by Mark who finished 4th overall in the Race and 1st V40 in a time of 4hrs 46.15. Matt who has battled with injuries now for quite a long time, came home in 43rd place with a total time of 5hr 19.16 told the Club after the Race that he had no problem with injuries and felt good, running strong but a wrong turn on the Run cost him dearly and meant he had two miles further to run. 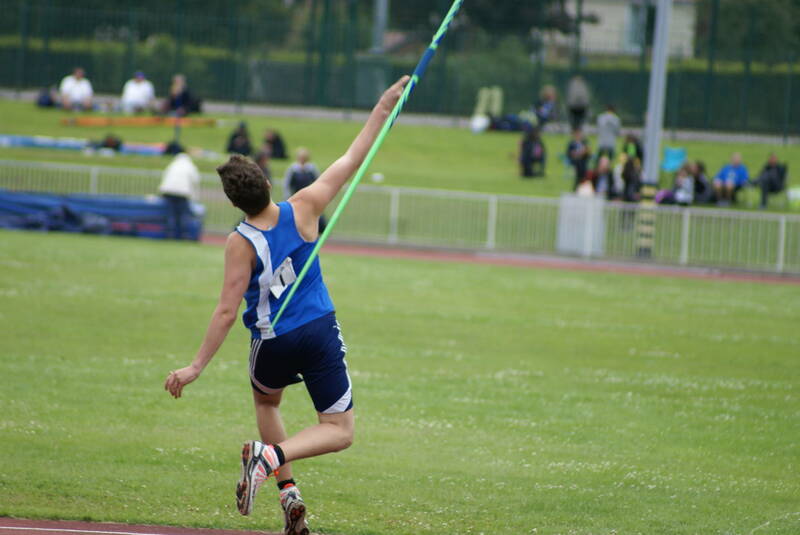 Round 3 in the YDL Upper Age Group Premier League took place at the famous Bebington Oval last weekend in a mixture of sunshine and rain. The Harriers Team was depleted by athletes at other competitions and injuries, but nevertheless, there was no shortage of effort on the day with some new athletes who hadn’t been involved at this level of competition previously. 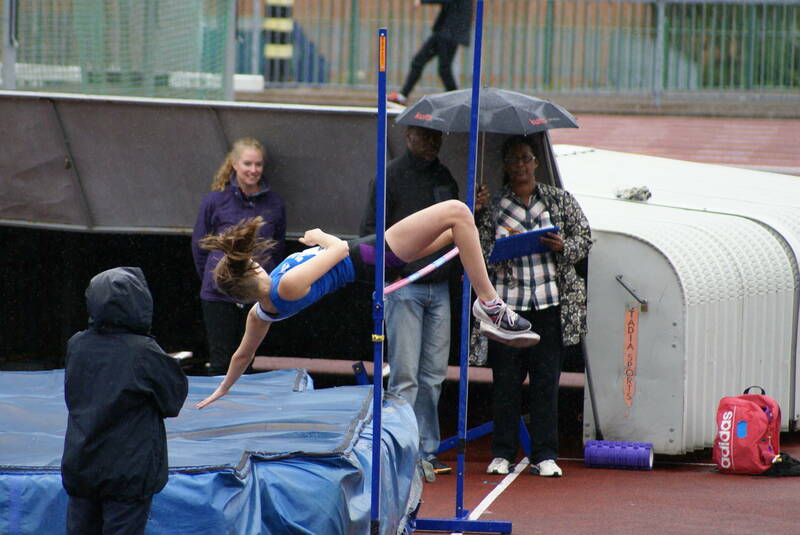 Their effort was rewarded with new personal bests for Maddie Elliott; Chloe Bleeks; Olivia Wilson; Freya Black; Ross Liddle; Connor Davison; Anthony Kent and Jessica Kit. 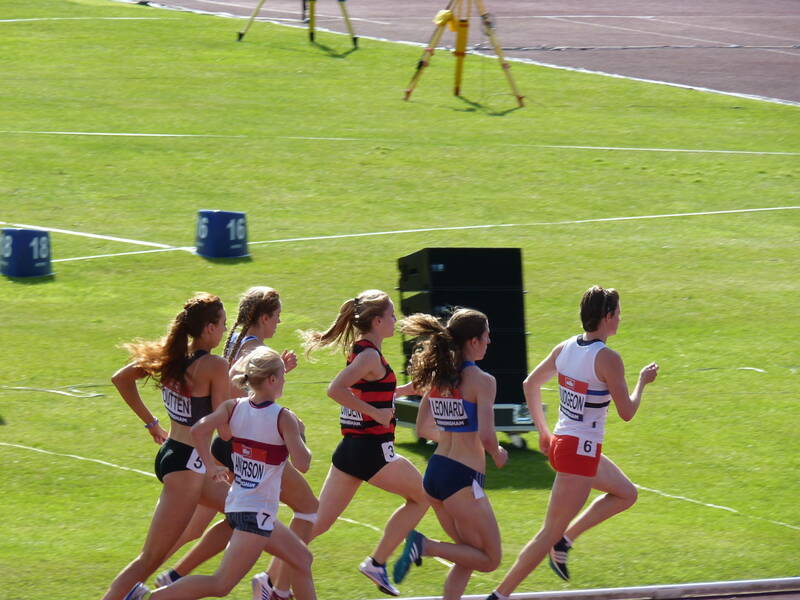 Performance of the day belonged to Maddie Elliott who won’t be 16 until October and goes from strength to strength with hardly a fixture going by where she doesn’t record a new PB, and this was no exception. 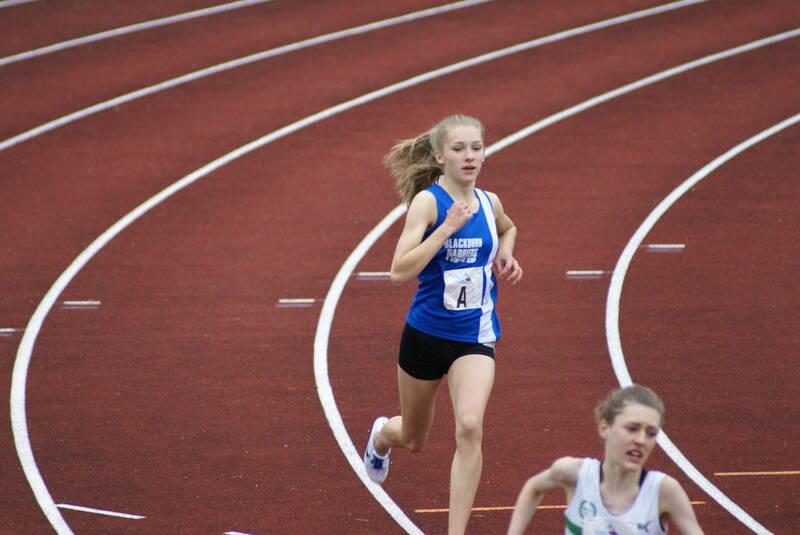 In the ‘B’ 800m Maddie clipped nearly three and half seconds off her time to set a new PB of 2.22.1 (2nd), then chopped two seconds off her 1500m time to set a new PB of 4.52.4 (3rd) and then made it a hat-trick of new PB’s on the day in the 300m Hurdles coming home in 2nd place with a time of 49.4. There were new PB’s for Chloe Bleeks (U17) showing her improvement over the sprint distances in the 100m with a time of 12.6 (2nd) which was a full second quicker than her previous best as well as for U20 Olivia Wilson in her 100m with a time of 14.45 (6th) before going on to run 70.5 in the ‘A’ 400m (6th) and the ‘A’ 800m placing 6th in 2.38.8. 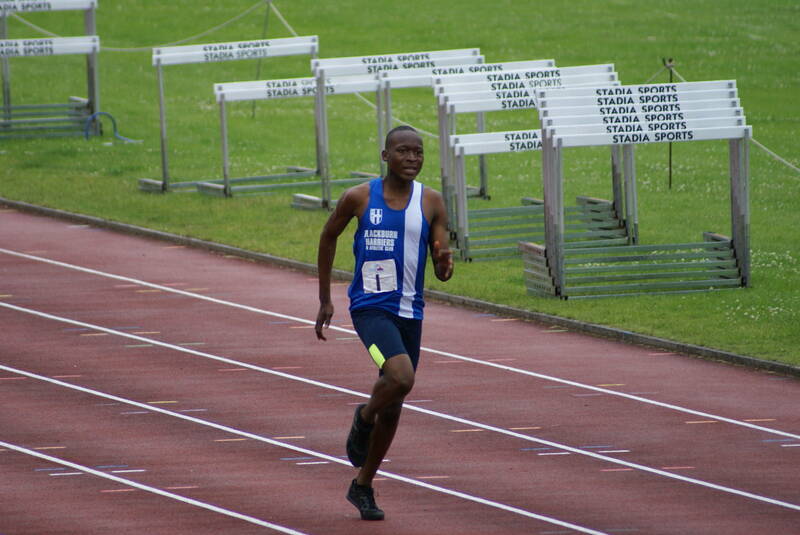 U20 John iLunga was just outside his PB, posting a time of 27.1 in his 200m event as was Chloe Bleeks again in the 200m where she placed 3rd in 28.5 and went on to take 4th spot in the Triple Jump (8.99m). 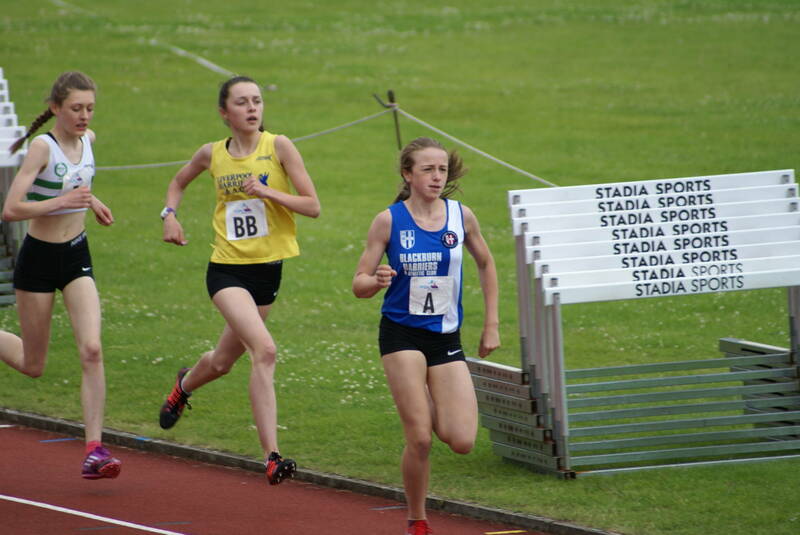 New member Hannah Proctor and bottom of age U17 ran well in the 200m for 4th place in a time of 30.2 as did Freya Black in the U17 300m when she clipped two seconds off her previous best to set a new PB of 48.8 (6th). 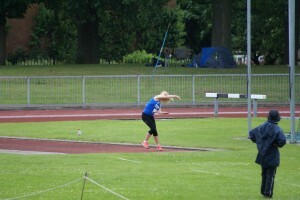 Hannah also went onto win the ‘A’ Shot Putt with a throw of 9.55m. 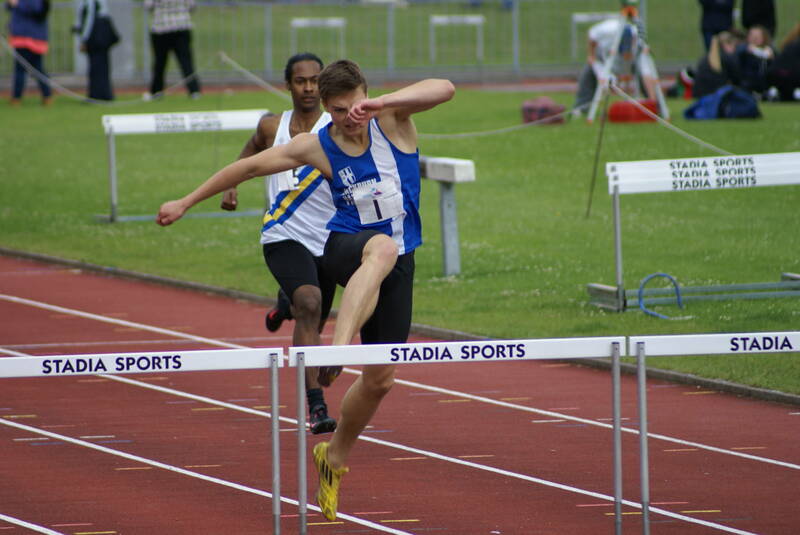 U20 Ross Liddle was in a very tough ‘A’ 400m Race won in 49.9 and the pace helped him to take four tenths off his old time to set a new PB of 52.1 (5th). 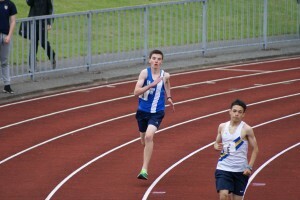 Ross made it a good day for him by winning the 400m Hurdle ‘A’ Race pretty comfortably. U17 Joe Gebbie who had never raced in a League fixture before was thrown in at the deep end in the ‘A’ 400m won in a time of 52.8. 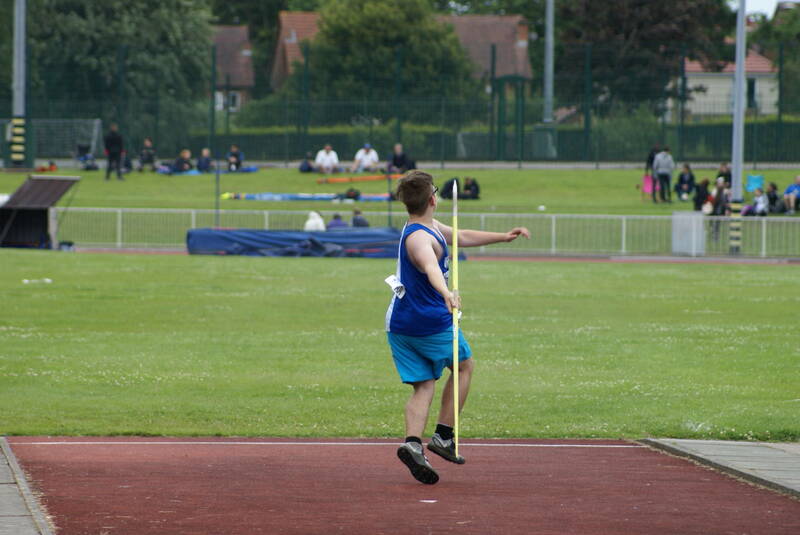 Joe got stuck in to record a time of 61.9 which was more than credible given that he hasn’t trained for the event and it was only his second ever race on the Track. 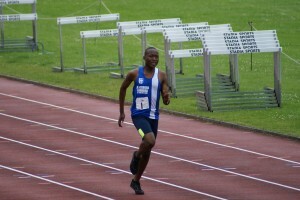 Undeterred, he went into the 800m ‘A’ Race finishing 6th in a debut time of 2.19.9 and fought the whole way and great to see in someone so new to competitive Track & Field. 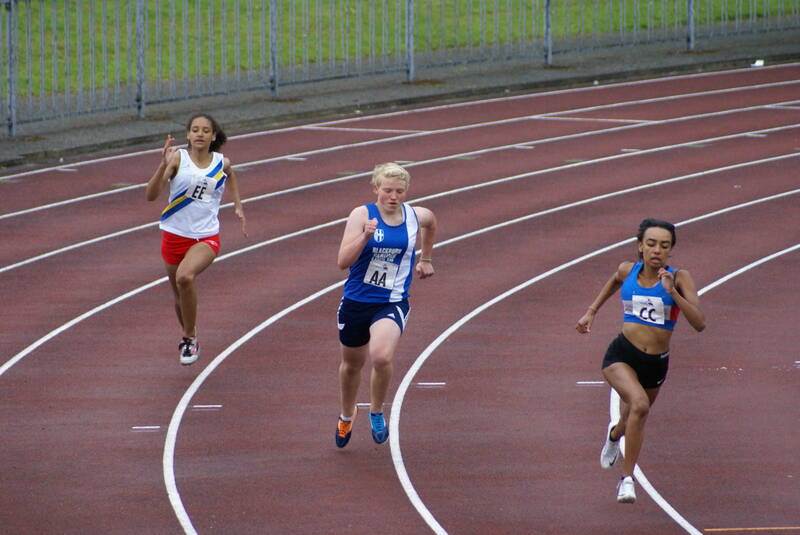 What a start to U17 Hannah Cookson’s 400m racing experience. She ran the distance ‘B’ race for the first time in her life and won the race with a time of 64.2 and didn’t she battle for it. 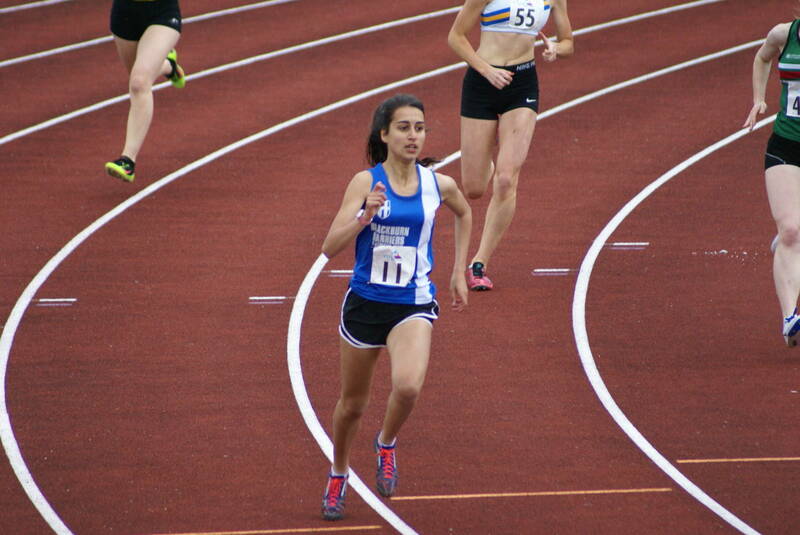 She followed that up with a 4th place in the ‘A’ 800m (2.30.8) and a 3rd spot in the Long Jump with a leap of 4.17m, just ten cms short of her PB. 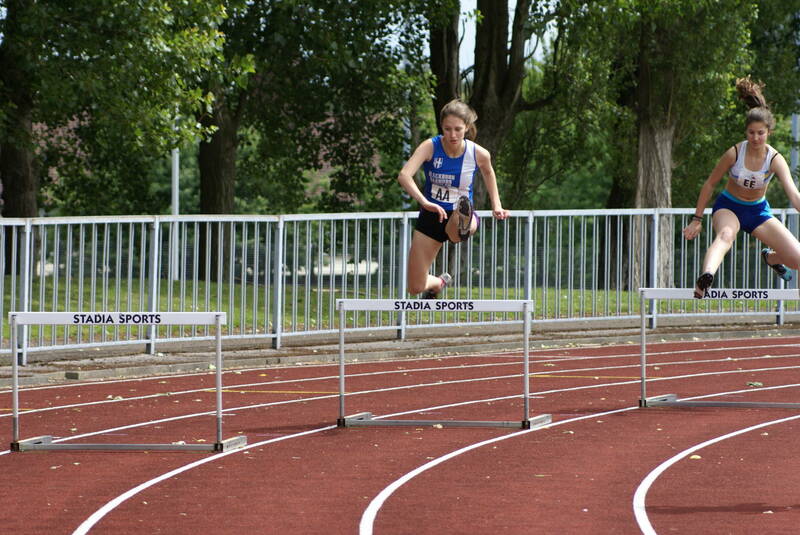 U17 Esme Pearse placed 6th in the 80m Hurdles (15.4), 2nd in the 300m Hurdles (59.2) and 4th in the High Jump with a clearance of 1.40m. 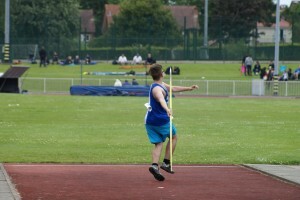 U20 Ben Aspinall who hasn’t got a lot of competition behind him this year has started to find his feet again. He won the ‘A’ Triple Jump with a leap of 13.14m, came 2nd in the ‘A’ Long Jump with 6.25m, just ten cms off his PB and in his first High Jump since August 2015 came 2nd with a clearance of 1.70m just five cms shy of his best height. 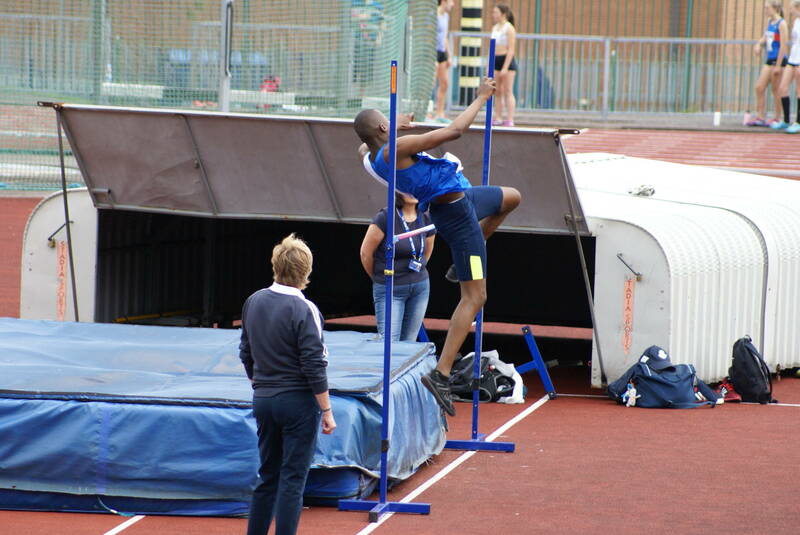 John iLunga (U20) was just outside his High Jump PB with a clearance of 1.60m taking maximum points in the ‘B’ and equally just outside his Long Jump PB with a jump of 4.71m (3rd). 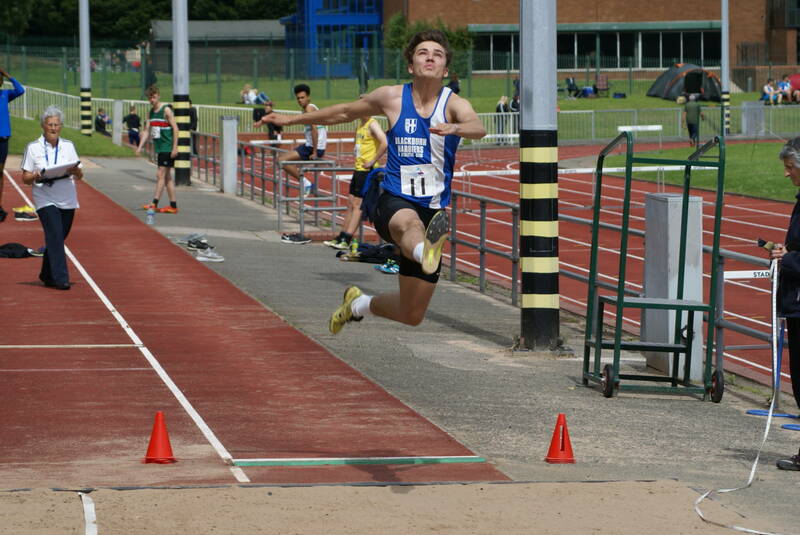 John took some good points again in the ‘B’ Triple Jump (3rd) with 9.58m. U20 Connor Davison one of the long standing members of the Clubs young throwing squad set a new PB in the Shot Putt (6kg) placing 3rd with 9.65m, wasn’t far off his best in the Discus (1.75kg) with a 3rd placed throw of 29.36m and added a 5th spot in the Javelin (30.49m). 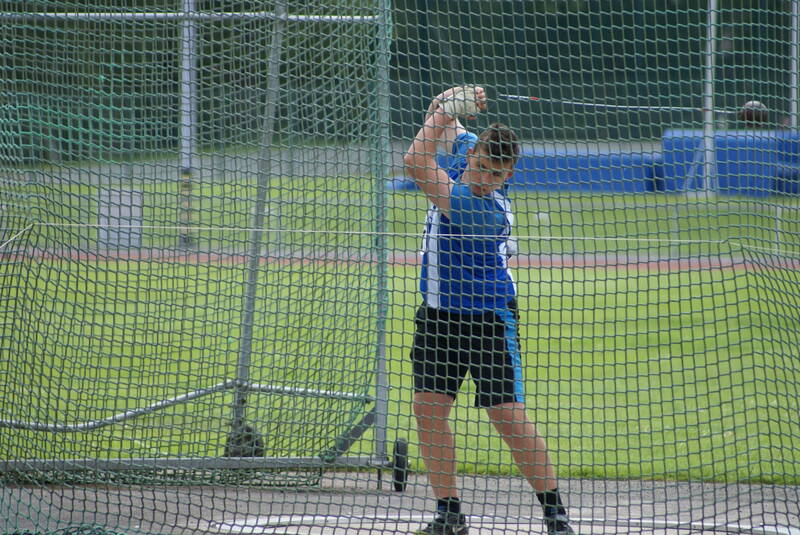 U17 Anthony Kent set his day off in good form with a new PB in winning the ‘A’ Hammer (5kg) of 42.91, then set another new PB in the Shot Putt placing 3rd with 11.23m and finished the day off with a 3rd in the Discus (37.78m). 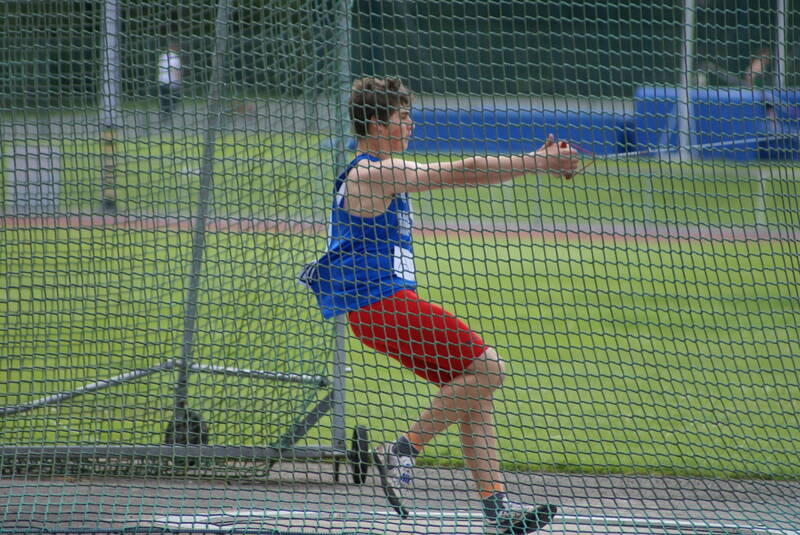 15yr old Lucas Davies took on the higher weight Shot Putt (5kg) for the first time taking a good 2nd place with 6.92m, just missed a PB in winning the ‘B’ Discus (1.5kg) with 23.07m and adding a 5th placed throw of 23.90m in the Javelin. 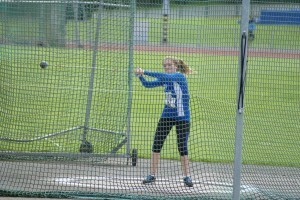 A real stalwart of the Club is U20 Thrower – Rebecca Orrell. 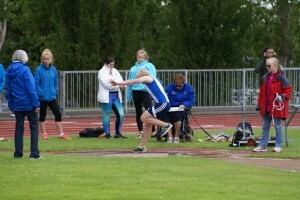 She took 2nd spot in the ‘A’ Shot putt (8.40m), 2nd again the Discus (1kg) with 22.76m and 2nd again in the Hammer with a throw of 44.19m. 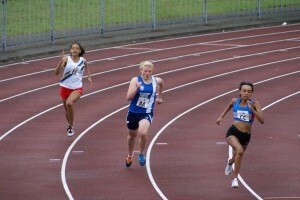 Such great consistency from Rebecca every time she competes. 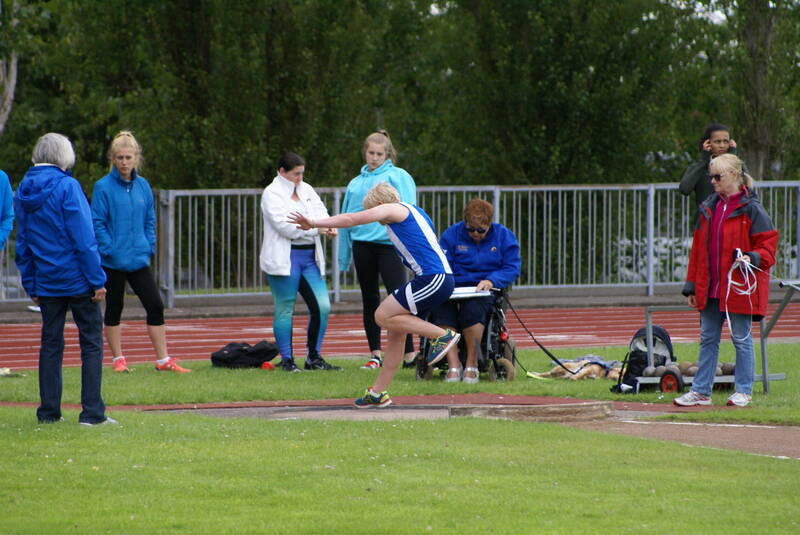 U17 Jessica Kit who is in here first competitive season set herself a new PB in Shot Putt (3kg) with a throw of 6.85m (3rd), then set another new PB in Discus (1kg) with a throw of 17.06m and was off the pace in the Javelin in 4th spot (12.43m). 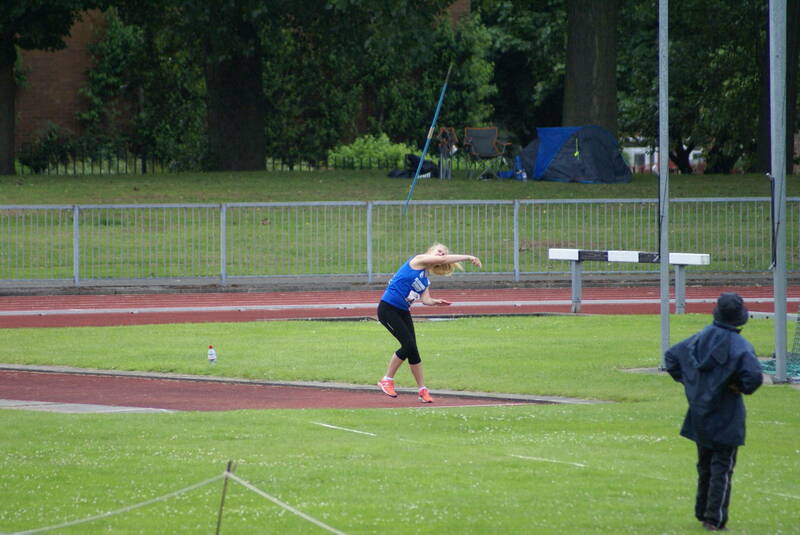 Yet another new athlete in her first season of competition was Charlotte Heyworth who took all the points in the ‘B’ Discus (1kg) with a throw of 14.42m, came 3rd in the Javelin (12.19m) and rowed in for the Club by having a go at the Hammer (5th) with 9.78m. 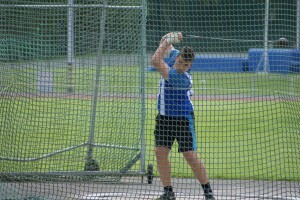 U17 Jacob Roberts who is currently ranked 2nd in the country won the Hammer (5kg) with a throw of 65.63m. Jacob has been out in fourteen competitions this season, winning 13 and finishing 2nd in the other which is a pretty impressive record. 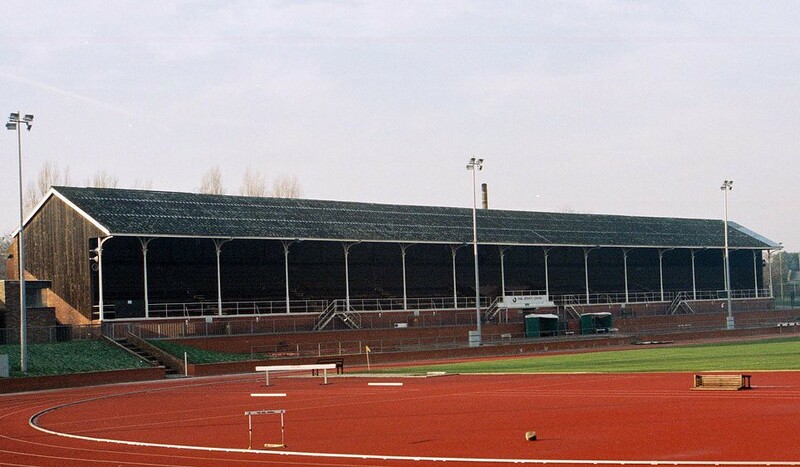 The British Track & Field Championships held in Birmingham over the weekend doubled as the qualifying competition for the Rio Olympics being held in August later this year. 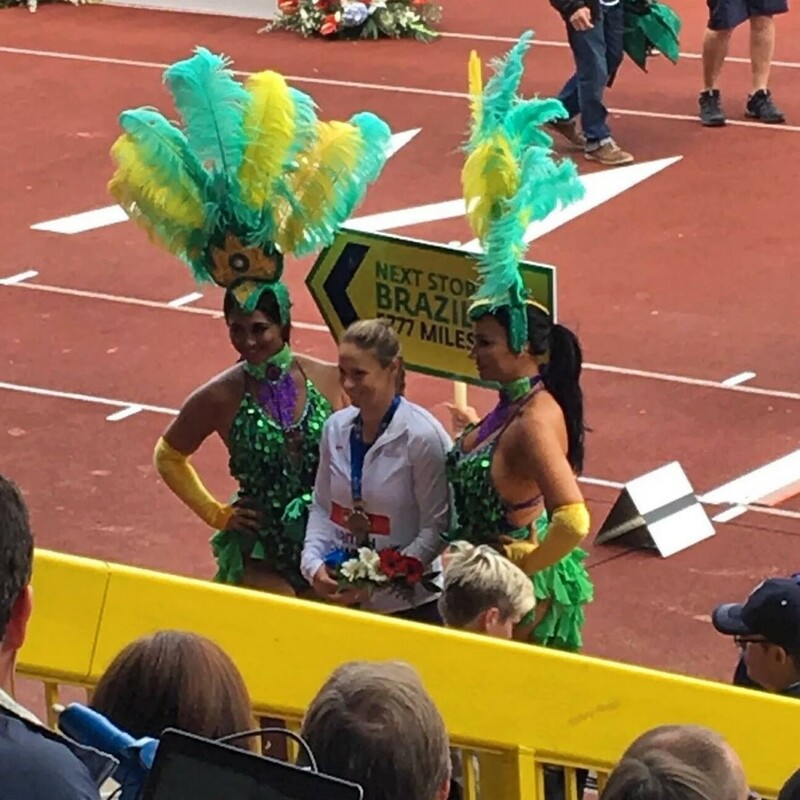 Blackburn Harriers Holly Bradshaw and Sophie Hitchon, not only became British Champions again but also booked their place on the plane to Rio to compete in their second Olympics in four years. 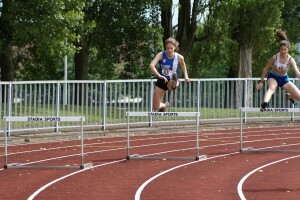 Samantha Murray – who won the Silver Medal at London 2012 – has already been selected to represent GB in the Modern pentathlon which means that for the second time in the last four years, these outstanding young athletes will be competing in the Olympic Games – a fantastic achievement by any measure. Holly won the Pole Vault with first time clearances of 4.34m – 4.50m – 4.60m and then attempted 4.72m to defend her title which she had won in 2014 and 2015. 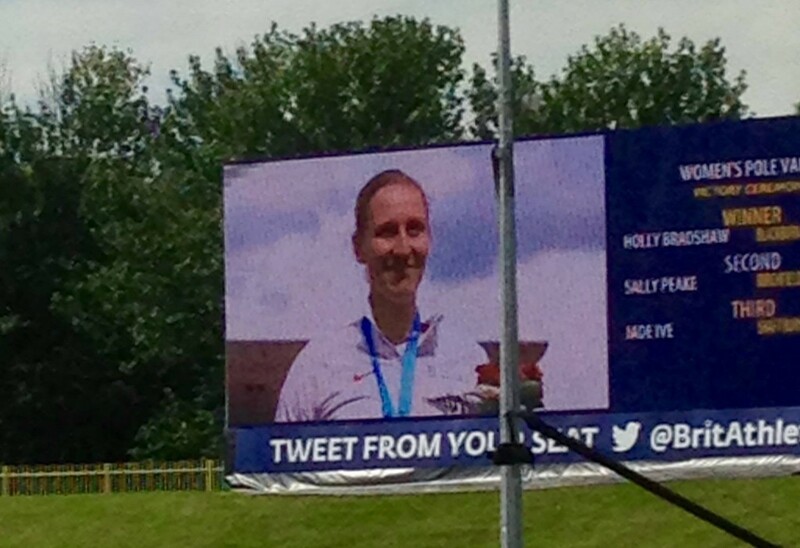 After the competition Holly told the Club “I’m incredibly pleased to qualify for my second Olympics and to win the British Champs again was amazing. I have been trying to figure stuff out recently in competition as my training jumps are much better then in competition. But the more I compete the better it gets so I’m excited to keep competing and building momentum towards Rio! I am looking forward to the next 4 weeks and my remaining competitions before heading out to Rio on the 1st August.” Holly will now spend her time concentrating on her preparations for Rio. 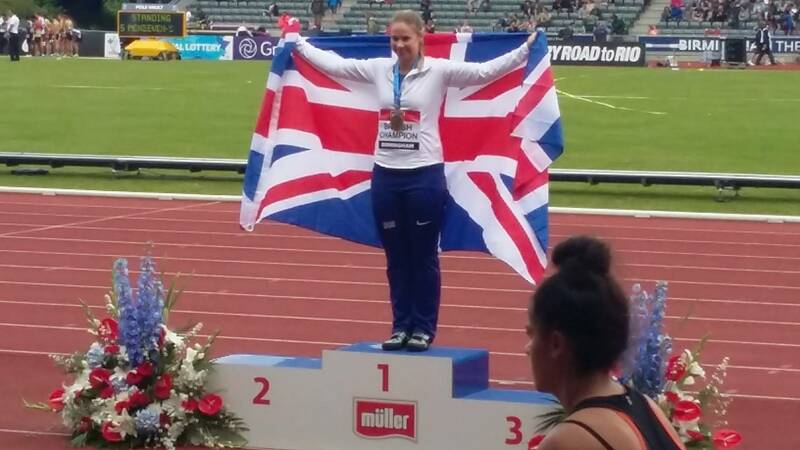 Sophie retained her British title which she has held since 2014 with a throw of 69.99m and speaking to the Club after the successful weekend, she said “I am very proud to come away British Champion again. Sometimes it can be the hardest competition when your expected to win. It wasn’t a great performance and would have liked to throw a little further, but the main aim was to win and seal my place on the team for Rio. 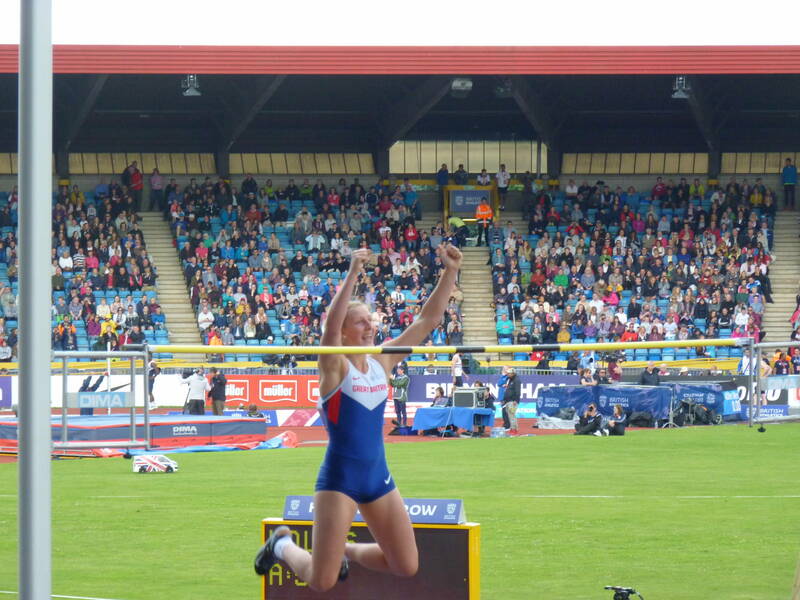 I have the European championships next and am looking forward to competing in Amsterdam”. Sophie’s next competition sees her competing for Great Britain in the European Championships which starts on July 6th in Amsterdam. 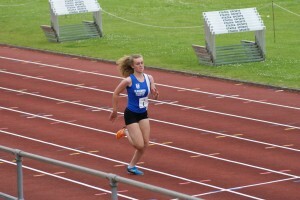 Alison Leonard who is having a very good season was also hopeful of qualifying for the Olympics in the 800m having already achieved the qualifying time. 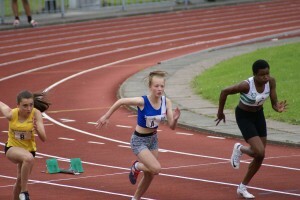 She comfortably won her Heat in a time of 2.03.30, unfortunately, it wasn’t to be in the Final as she finished agonisingly close in 3rd place to miss out by just three tenths of a second. But Alison now moves on to the European Championships in Amsterdam (July 6 -10th) where she has been selected to contest the 800m for Great Britain. 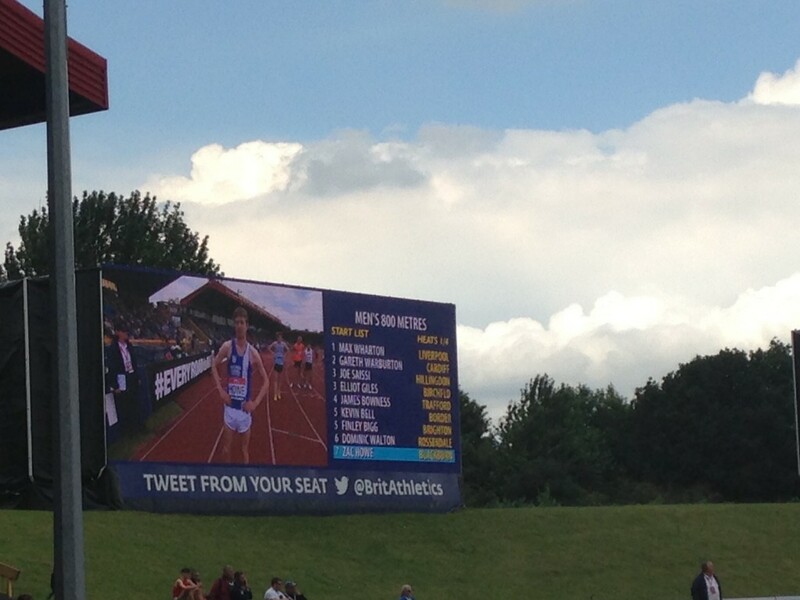 It was a proud day for the Howe Family watching Zac Howe run in the 800m Heat (1) placing 8th out of the ten athletes in a time of 1.52.47.After his experience at the Championships, Zac shared his thoughts with the Club saying “it was amazing to be in the company of such great athletes and to see fellow Blackburn Harriers do so well. The highlight has to be walking into the stadium and waving to my family in the crowd. 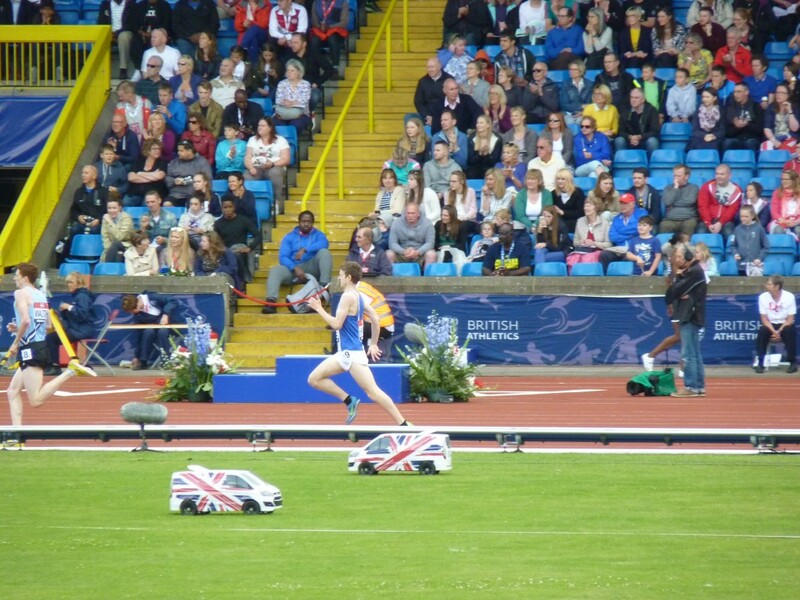 The race itself could have gone better but I went into it with zero expectations. I came out though with a real taste for that level of competition. I would love to be there again and I’m going to make sure that I can be more competitive next time.” Just in front of Zac in 7th place was Dominic Walton from Rossendale, also racing on the national stage. 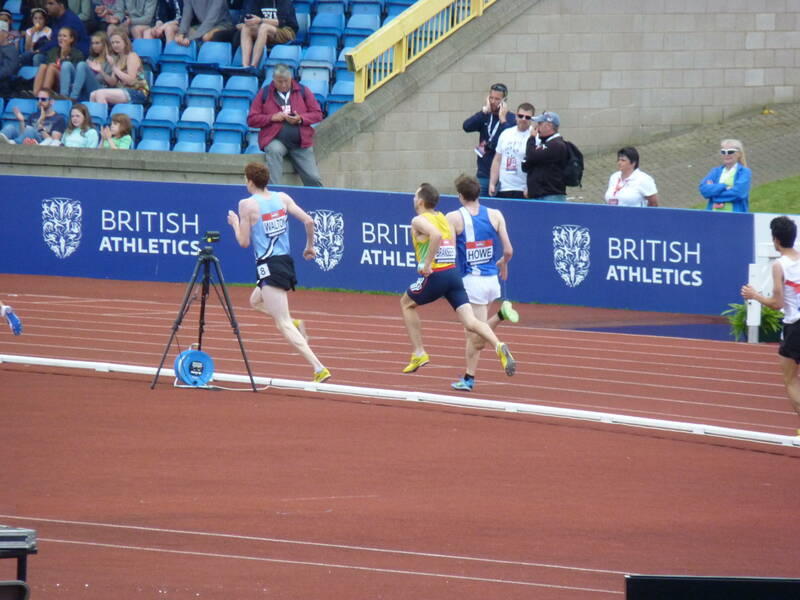 Great to see local athletes competing in the British Championships. Best Mac for software improvement: finding iPad and iPhone programs to be created by an Apple Mac Which Mac should you reach begin app progress? With Apple Swift willing to reach the popular and Xcode 6, it truly is likely to get yourself a lot easier to creator iPhone and applications that are iPad. This is actually the Mac you must get. Many Mac owners are not uninterested in creating their own applications, and Apple helps it be very easy to generate and develop (and sell) apps for the Macos X and iOS platform. 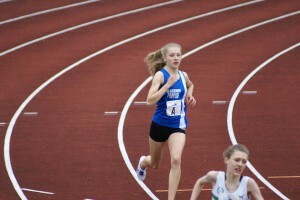 Blackburn Harrier – Sophie Hitchon – was in Poland at the weekend competing in her fourth competition of the year just a week before the British Championships & Olympic Trials being held in Birmingham. She has really been on the move in Olympic year competing in Jamaica, Beijing, Germany and now Poland. 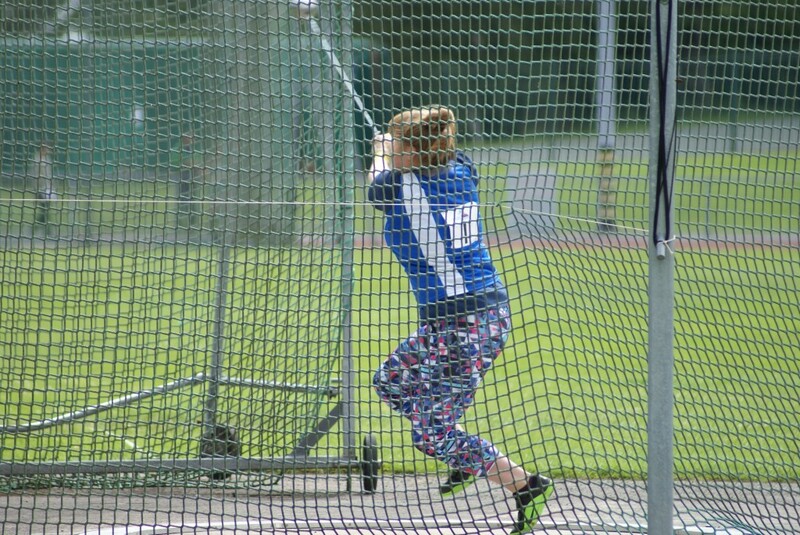 Sophie finished 2nd in the Polish competition with a seasons best throw of 71.86m and the reigning British Champion in the Hammer was happy with her latest outing, telling the Club “I was pleased with the result and getting a SB, looking forward to competing at Birmingham this weekend. It is always a great atmosphere”.